New York City FC today announced that Alex Callens, Sean Johnson and Alex Ring have all agreed to new long-term contracts with the Club. The trio will remain in New York City for 2019 and beyond after agreeing to terms on multi-year deals. All three players, key figures in the City locker room, joined the Club ahead of the 2017 MLS season and have since gone on to make a combined 190 appearances across all competitions. Callens, Johnson and Ring are vital components to the spine of the team and have played pivotal roles in City’s successful spell the past two seasons. 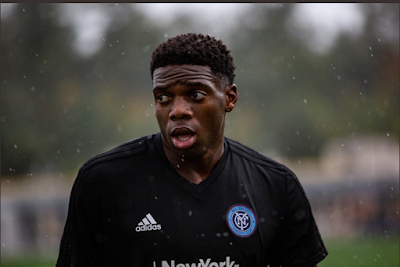 Known amongst fans as “NYCFC’s Iron Man,” Callens began his NYCFC career showing off his metal. Beginning March 5, 2017, the Peruvian went on a a remarkable run of 3,585 consecutive minutes played in MLS regular season matches. During that span, Callens helped anchor a defense which kept 10 clean sheets. Callens has also contributed at the other end of the pitch throughout his time in New York. In 65 matches with the Club, the central defender has found the back of the net three times, most recently to earn a 1-1 draw with Atlanta United on June 9. His stellar play recently earned him an opportunity to represent Peru once again at the international level. Sean Johnson has seen his career elevate since joining City in 2017. Johnson matched a career high in shutouts in his first season with seven, something the U.S. international hadn’t done since 2011 with the Chicago Fire. The shot-stopper’s form in the first half of 2017 saw him return to the U.S. Men’s National Team for the 2017 CONCACAF Gold Cup. Johnson’s 2018 campaign has built off his 2017 success. For the first time in his career, Johnson has kept double-digit clean sheets (10). In July, Johnson broke Club records by going 396 consecutive minutes without conceding a goal which included four shutouts. Johnson said, “I knew that once I played my first game with the club, it was somewhere I wanted to be for a very long time. Alex Ring became the fifth NYCFC player to be selected to an MLS All-Star team in 2018. Known league-wide for solidifying the spine of the City squad, the Finnish midefielder has shown his versatility by playing as a make-shift center back at times as well as scoring two goals playing in more forward positions. Ring’s two goals in City blue have come in crucial moments in their respective matches. Trailing by a goal in hostile confines at Mercedes-Benz Stadium in Atlanta, Ring sent a rocket past Brad Guzan as City came from behind to earn a point against Atlanta United. His second goal turned out to be the one that clinched City’s spot in the 2018 playoffs. Johnson and Ring will be supporting Soccer Day in New York City on Monday October 15, when 10 more New York City Soccer Initiative mini-soccer pitches come online across the five boroughs, as part of the partnership between NYCFC, the Mayor’s Fund to Advance NYC, the U.S. Soccer Foundation, Etihad Airways and adidas.